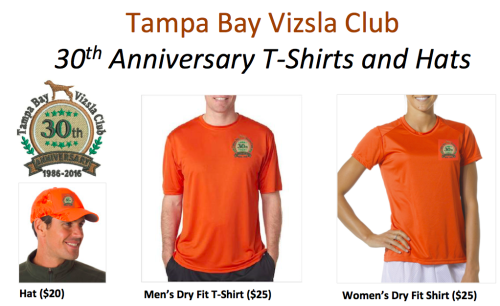 The Tampa Bay Vizsla Club > Uncategorized > Celebrate TBVC’s 30th Anniversary! The Tampa Bay Vizsla Club is celebrating it’s 30th Anniversary! To commemorate this milestone, we have designed special Hats and DryFit Shirts for our annual Fun Days event (June 4-5) that are available for purchase starting now! The deadline to order is May 13th. Shipping is available if you are not able to pick up your order at Fun Days. Contact Danny (DNeg5@nullaol.com) or Kristen (ktsully74@nullyahoo.com) for questions or additional information. Click Here to download the flyer and order form today!